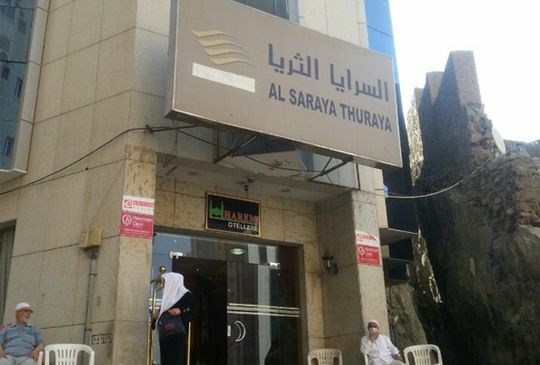 Al Thorayya Hotel is located in Mecca, just a 5-minute walk from Al-Masjid al-Haram Mosque. Guests can enjoy free WiFi in the rooms as well as in the lobby.Each room here features air conditioning, a seating area and a private bathroom with a shower and free toiletries. A refrigerator is also provided.It offers a 24-hour front desk and a complimentary coffee, tea and water corner in the lobby for guests.Al Thuria hotel is 250 m from Al Masjid Al Haram.This is our guests’ favourite part of Makkah, according to independent reviews.We speak your language! Dar Al Eiman Al Nour is situated in Al Madinah, 200 m from The Prophet’s Mosque and 1.1 km from Old Bazaar. Free private parking is available on site.All rooms are equipped with a flat-screen TV. Each room is fitted with a private bathroom.Al Baqia Cemetry is a 5-minute walk from Dar Al Eiman Al Nour. Free private parking is available and subject to availability upon arrival. This is our guests’ favourite part of Al Madinah, according to independent reviews.We speak your language!